Hi Bus Talk. With the closing of Rider Diaries I thought I'd move this thread over here. 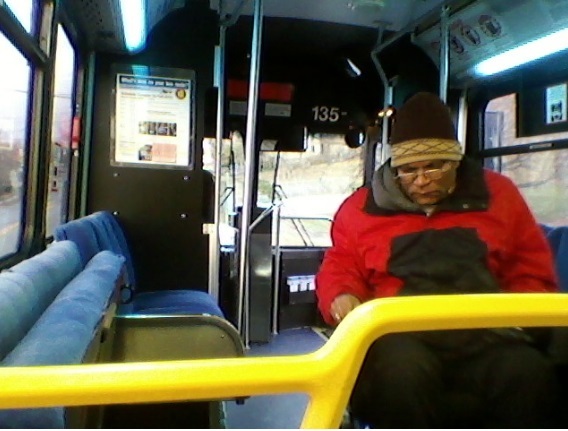 For twenty-two years (1991-2013) I commuted to work everyday on Bee-Line buses. Now I work at Cross County Shopping Center in Yonkers. I get off work at 3 PM. The next 25 bus is at 3:22 PM. If I drive I'm home by 3:20. But I occasionally take the bus anyway. I took the first photo while waiting for the 14 with a NABI hybrid on a nasty night. At least we were headed home! 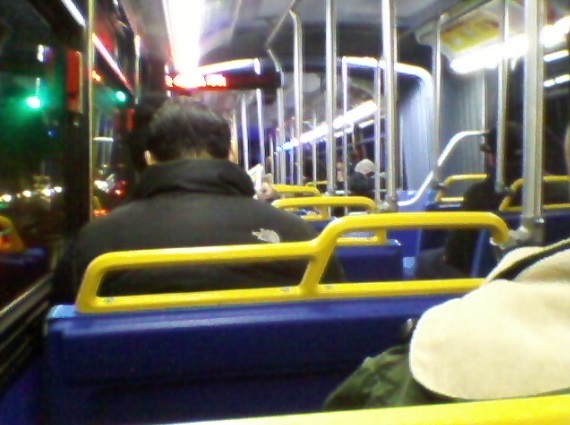 The second shot was taken while heading to Elmsford Square on a Bronx-bound 1C Artic. Final shot, here's the 13 and the final leg home. All photos shot in December 2012. White Plains-bound 14 stops at Warehouse Lane and Rt. 9A on a nasty night in December 2012. Bronx-bound 1C nearing Elmsford Square. Dec. 2012. Tarrytown-bound No. 13. Elmsford NY Dec. 2012. Commuting by bus is tough in January and February. After I moved to Yonkers I decided one day, when snow was in the forecast, to drive to work in Elmsford. BIG mistake. When I went home the Sprain Brook Parkway was snarled from 287 to the Tuckahoe Road exit where I got off. I live in a very hilly part of Yonkers and...long story short: it took me an hour-and-forty-five minutes to get home. Next time it snowed I stuck with Bee-Line. Because of the hilly streets in my neighborhood I opted to ride a 6 rather than a 5 (transferring from a 1C at Ardsley Square) because it was an easier walk from the bus stop. The 6 got me to North Broadway and Shonnard Place only five minutes later than the schedule. It was much better than driving! 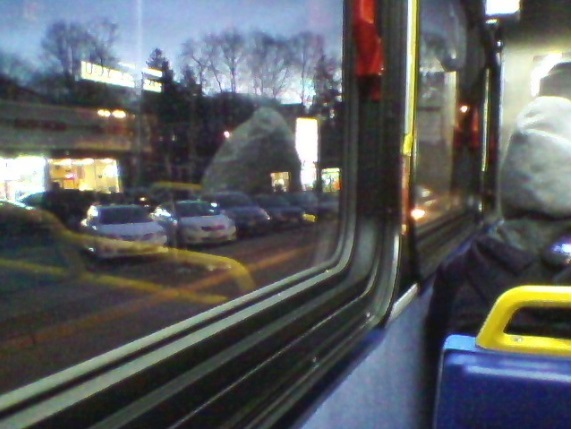 The first photo below was one I shot with my cell phone on the 6 (a NABI hybrid) at a bus stop in Hastings. The quality isn't the greatest I admit but this is a grab shot. The second photo is one I took on another NABI hybrid, a homeward-bound 1C as we approached Ardsley Square on the first working day of January 2013. It was almost five o'clock and still not totally dark. No. 6 heading to Yonkers on a snowy evening, making a stop in Hastings, December 2012. January 2, 2013 on a 1C approaching Ardsley Sq. 02/03/14 A Bee-Line No. 30 bus skidded in slushy snow as it turned left off Lockwood Avenue onto Saw Mill River Road in Yonkers. 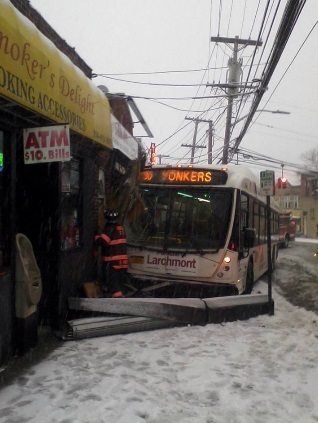 The bus mounted the sidewalk at 307 Saw Mill River Road and slammed into the front of the Saw Mill Deli. One route that I ride fairly often is the 9-North Yonkers Loop. This is an interesting route for two reasons. First, it is a one-way route, it starts and ends at the Yonkers railroad station. Outbound it operates on Nepperhan Avenue to Walsh Road to Palisade Avenue (by the Schlobohm housing projects). Then it operates on Palisade to Ashburton, north on Vineyard Avenue to Sullivan Drive, Ridge Avenue and Lake Avenue to Park Avenue. From there it duplicates the No.2 route until it reaches Southern Westchester Executive Park. The 9 goes east on Executive Blvd. all the way to Nepperhan Avenue where it duplicates the southbound 5 route to Walsh Road. Then the 9 loops around Schlobohm and back to Yonkers railroad station via Nepperhan. The second noteworthy thing about the 9 is, it operates with the few remaining 32-foot Orion Vs in the Bee-Line fleet. Back in 2005 Bee-Line ordered 21 (116-136) Orion V 32-footers to replace the Navistars on shuttle routes. Below the first photo is of Bee-Line 135 on the outbound 9 getting ready to turn left onto Shonnard Place off Park Avenue (opposite Gorton HS). What's unusual about the 32-footers is the seating. 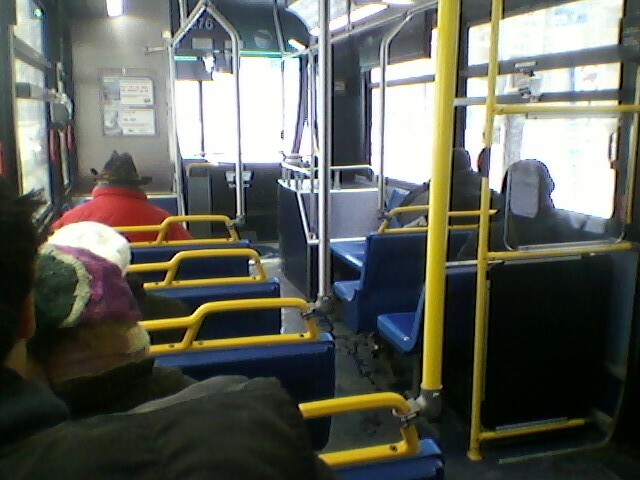 They seat 30 riders but only four seats are forward facing, everything else (including all seats on the curbside) are bench-style. The middle pic was also taken on 135 on Route 9. The route usually alternates between using 135 or 136. Occasionally I have seen 118. 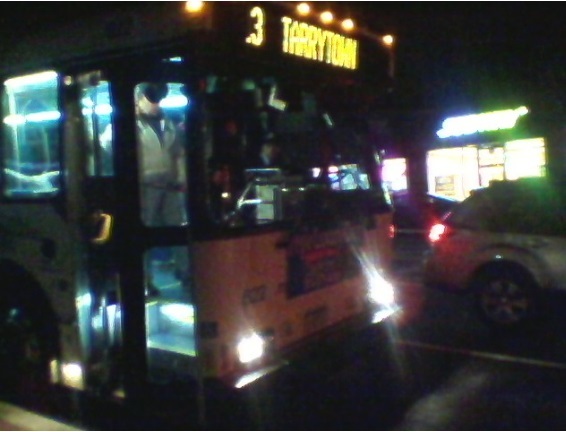 The shortys can easily accommodate wheelchair passengers as the final photo illustrates on an outbound 9 on Park Avenue. Many thanks, Tommy, for your description of bus lines and equipment in northern Yonkers. Almost weekly, I visit McDonald's on Nepperhan Avenue, just south of where the #5 streetcar had a passing siding. Finished with lunch, I drive up Executive Blvd and meet whatever 9's, 6's, or 2's around. Then I visit in Hastings. Bee-Line deservedly gets patronage, but I think the folks of Nepera Park have a hike to a bus stop. They cannot walk across the parkway to catch a 5 north of Odell Avenue. I must watch for the 32-foot Orions by fleet number. My eyes won't catch the difference. You're welcome Joe, my pleasure! Btw, once upon a time the residents of Yonkers' Nepera Park neighborhood (north of Odell Avenue, west of the Saw Mill River Parkway) had a street car line, the one you mentioned, the Yonkers Railroad No. 5, running north on Nepperhan Avenue to Tompkins Avenue. That ended in July 1952 when the northernmost 1.7 miles of operation was discontinued. 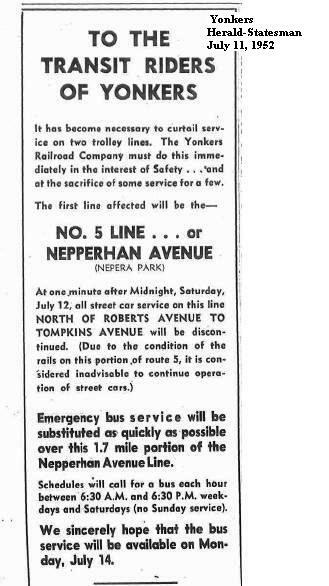 The first two attachments below show the ad Third Avenue Transit Corp. placed in the Friday July 11, 1952 Yonkers Herald-Statesman newspaper, announcing the pending service change. Yonkers Railroad was a subsidiary of Third Avenue Transit. 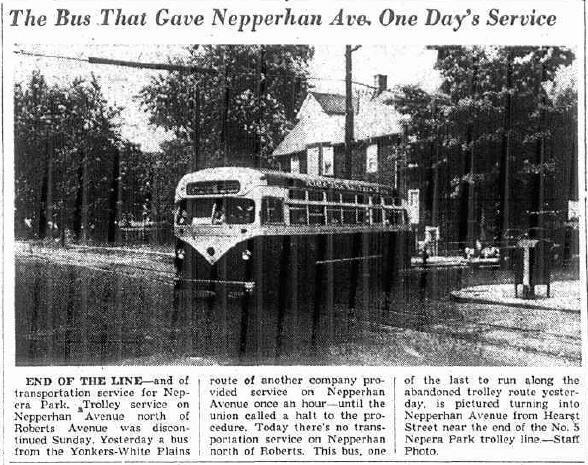 As promised, on Monday July 14, 1952 the Yonkers-White Plains Route H buses of another Third Avenue Transit subsidiary, Westchester Street Transportation Company, began looping through the Nepera Park neighborhood. This route normally operated on Saw Mill River Road (Rt. 9A) but instead used Hearst St (crossing the Saw Mill Parkway) to reach Nepperhan Avenue and serve former streetcar patrons left without service. This didn't last too long, though. 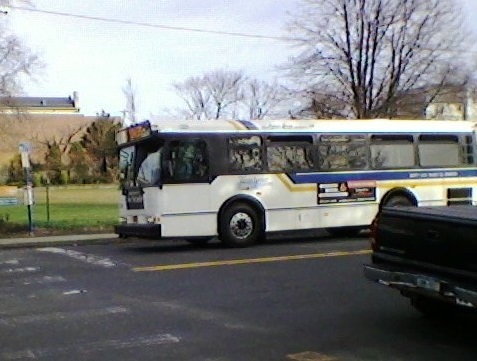 The third attachment below shows a news photo of a Yonkers-bound bus turning left off Hearst Street onto Nepperhan Avenue. Local 100 of the Transport Workers Union understandably wanted Yonkers Railroad employees, not Westchester Street men, to get the work on the former streetcar route. The union said a few streetcar operators could easily be trained as bus operators. They could then use the two demonstrator buses Yonkers Railroad had already acquired to provide shuttle service between what had been the northern end of Route 5 (Tompkins Avenue) and the remaining No. 5 streetcar route. By Thursday July 17 an agreement had been worked out and service was restarted that afternoon, with Yonkers Railroad employees operating the shuttle bus and WST H buses remaining on their normal route along Saw Mill River Road. However I think the Nepperhan Avenue bus shuttle operated by YRR only lasted for a few weeks. Not enough riders on the route above Roberts Avenue and the bus shuttle was discontinued. 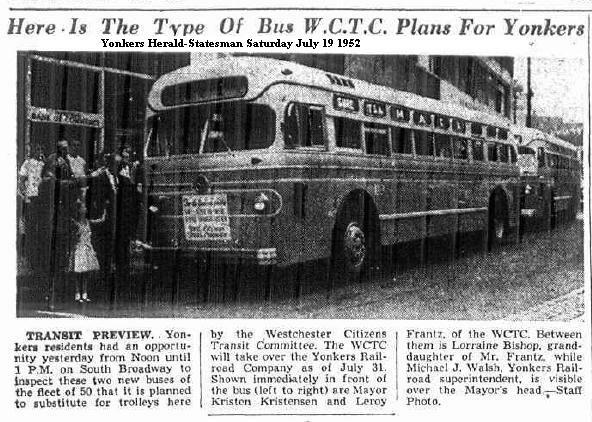 Btw I found a news article from the July 21, 1952 Yonkers Herald-Statesman in which it was reported, the TWU had agreed to have Westchester Street Transportation provide a bus and bus operators to operate the Roberts Ave.-Tompkins Ave. shuttle service along Nepperhan Avenue. This was to continue until Yonkers Railroad was ready to start operating buses. On Saturday July 19, 1952, Yonkers Railroad displayed the first two (of about fifty) Mack buses the new ownership group (a private operator) was acquiring to begin the bustitution of the streetcar routes. To come back to the present, last Saturday was a pretty nice day (at least for January), so when I had an errand to run in north Yonkers I decided to take a bus, a No. 6 on North Broadway. On the weekends the 6 (at least the ones to and from White Plains) seem to be mostly assigned Neoplan Artics. On Saturday every other 6 goes to/from Pleasantville and those usually seem to get NABIs or Orions (though mostly NABIs). Tuesday I had to run some errands in north Yonkers and I decided to leave the car where it was. I didn't want to lose my parking space, not after having to dig it out! I decided to take the 9 which was on a snow detour but that didn't really effect me. I've come to expect that after heavy snowfalls the bus uses Park Avenue rather than running via Vineyard Avenue. That part of the route has narrow streets and a couple of steep hills. The 9 was also supposed to be avoiding Palisade Avenue, detouring instead on North Broadway between Shonnard Place and Gateway Road (near St. John's Hospital). That didn't happen, however, the bus turned north onto Palisade Avenue and operated via Tudor Woods as usual. The going on Palisade Avenue was a little tight at times -- the snow made the street narrower than usual -- but there were no real problems that I could see. 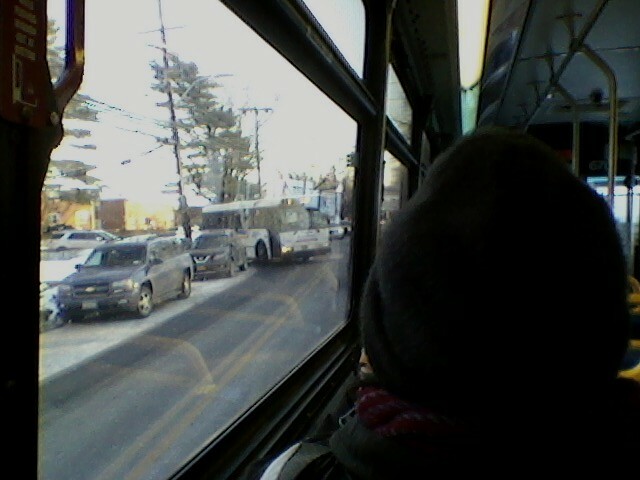 Route 2 buses also use that part of Palisade Avenue and they didn't seem to be having any difficulties. 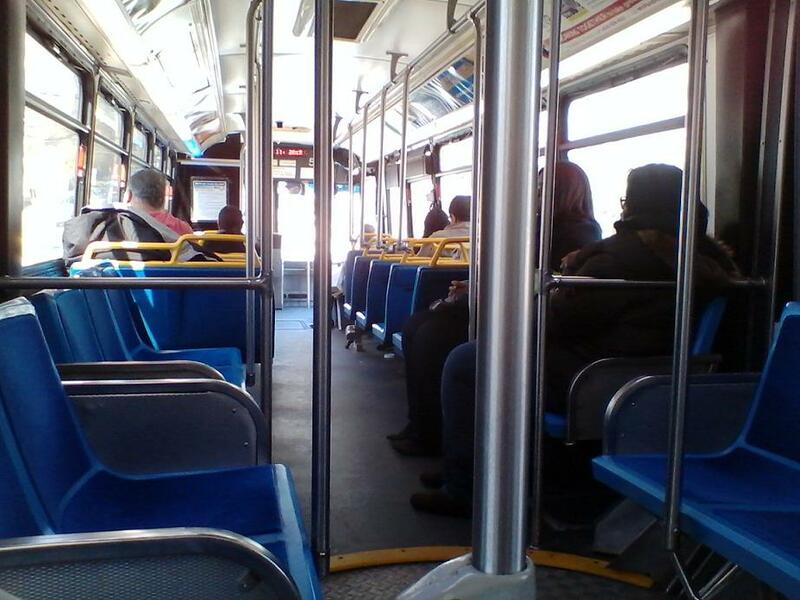 I stayed on the 9 as it looped through Southern Westchester Executive Park and back to Nepperhan Avenue. See first photo below, taken as we are approaching the intersection at Executive Blvd. and Nepperhan Avenue in the Nepera Park section of Yonkers. 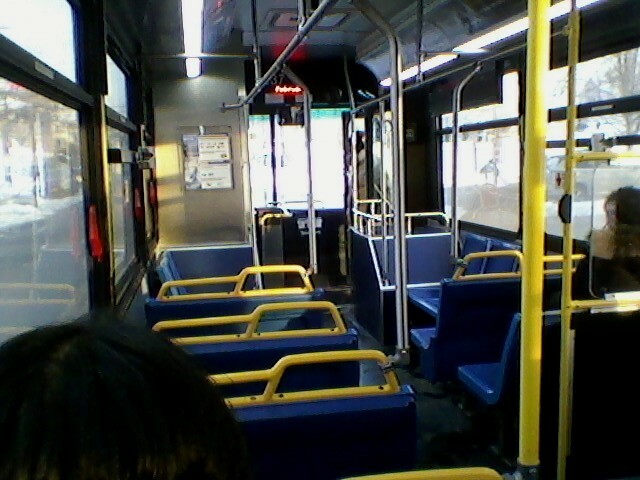 The 9 bus was even more empty than usual. 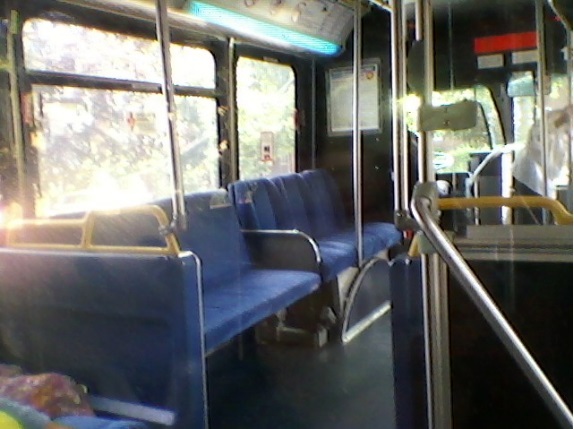 By this point it was just me and the bus operator. Passengers were waiting at the Odell Avenue stop, though, which was where I got off. Middle photo - I ran a few errands and then boarded a No. 5 bus, NABI 277, to go home. This late afternoon run is a short turn 5 that originates at Ardsley Square. 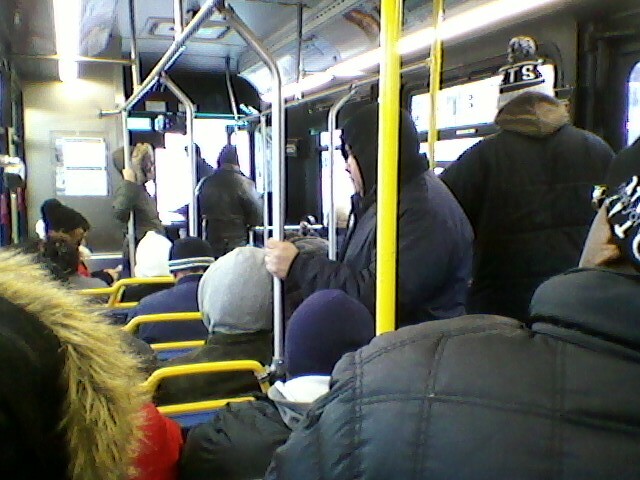 There were only a few people on the bus when I boarded at Odell Avenue but it began filling up. Mostly workers on their way home. Bottom photo - One busy stop was near Roberts Avenue where a lot of homeward bound school bus drivers boarded. From there south it was SRO! 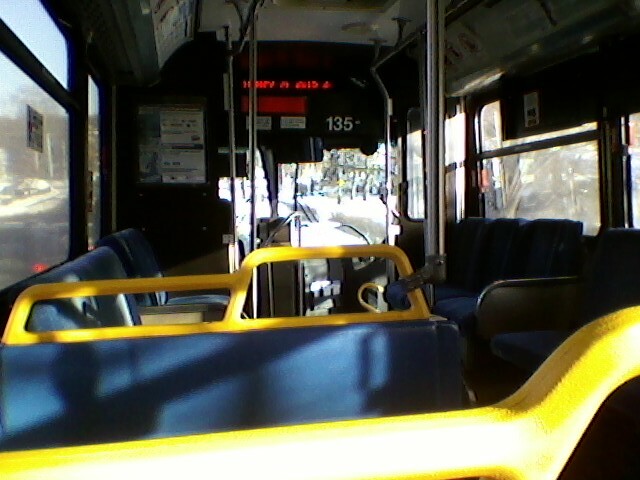 Earlier today on board a mostly empty low-floor NABI 237 on a Bronx-bound No. 2. This late afternoon run is about to turn off Shonnard Place onto Park Avenue in north Yonkers. The few riders were mostly sitting in the rear, raised portion. One oddity about the No. 2 and 9 buses is their route through Tudor Woods along Dehaven Drive in north Yonkers. Tudor Woods is a garden apartment development (with a couple of high-rises and, nowadays, co-ops) and Dehaven Drive is a narrow curving street through the middle of the development. Not the kind of street you expect to see a bus route operating along. The routing through Tudor Woods goes back some fifty-three years to the days when the route was operated by Yonkers Transit. In early 1962 the company petitioned the NY State Public Service Commission for permission to extend the route from the end point at Palisade and Roberts Avenues. 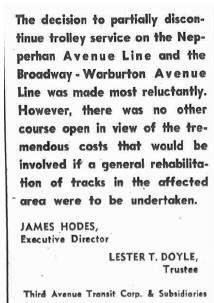 The article attached below, from the March 19, 1962 Yonkers Herald-Statesman explains the reasons. In June of 1962 the Yonkers City Council officially authorized the 2 buses to begin operating through Tudor Woods and that summer the extension was put into effect. The middle attachment below was taken from a No. 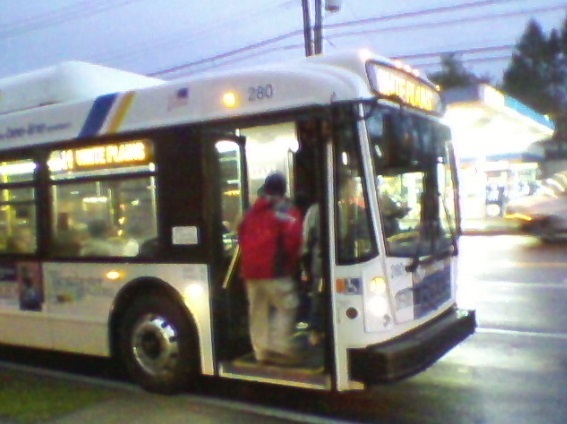 9 bus negotiating Dehaven Drive on a wintry day in March 2014. Since about 2004 the No. 2 route was further extended (during weekday rush hours) into the nearby Southern Westchester Executive Park. To accomplish this the buses turn west off Dehaven Drive onto Gateway Road. 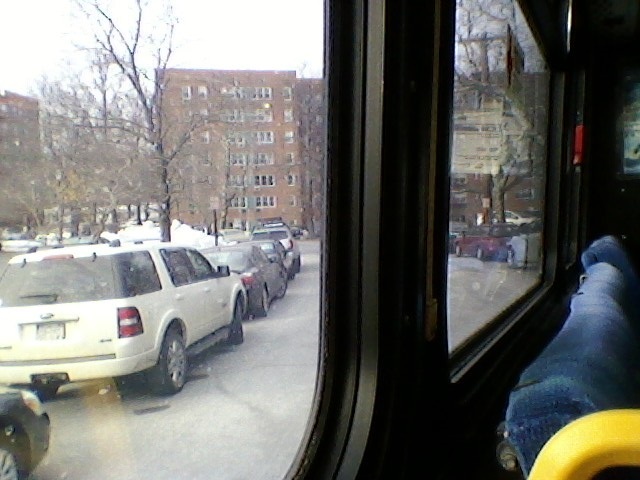 One short block later the buses turn north onto North Broadway and operate past St. John's Hospital to Executive Blvd. The buses then make a loop through Executive Park with the endpoint at Enterprise Blvd. and Executive Plaza. The last photo was taken last Fall from a No. 2 angling over on North Broadway to allow an Executive Park-bound 2 turning room off Gateway Road onto Broadway. Interesting posts and photos - thanks for sharing! You're very welcome. The thread has been running about 90 views a week which is all the thanks I need! Similar to a shot above, a Bronx-bound No. 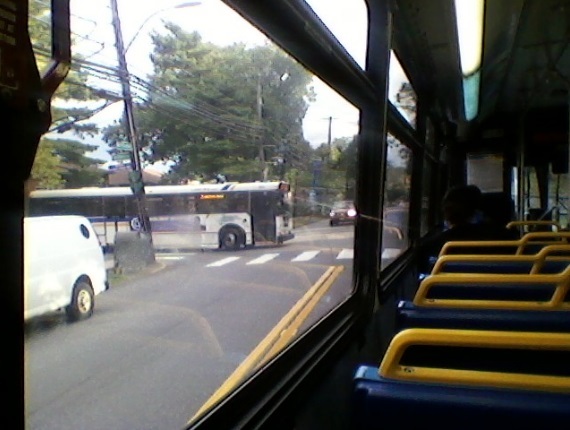 2 angling over to make room for a bus coming out of Tudor Woods in north Yonkers. Except this afternoon there was snow on the ground and the turning bus is an Orion V 32-footer 136 on a No. 9 run. 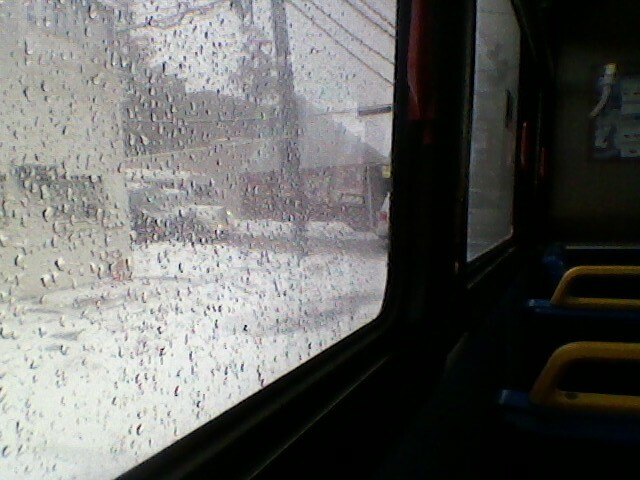 This afternoon I had to go out and with an inch of snow on the ground and more falling I decided to take the bus. The first shot was taken on a NABI, a northbound 6-Pleasantville on North Broadway near Gateway Road in Yonkers. 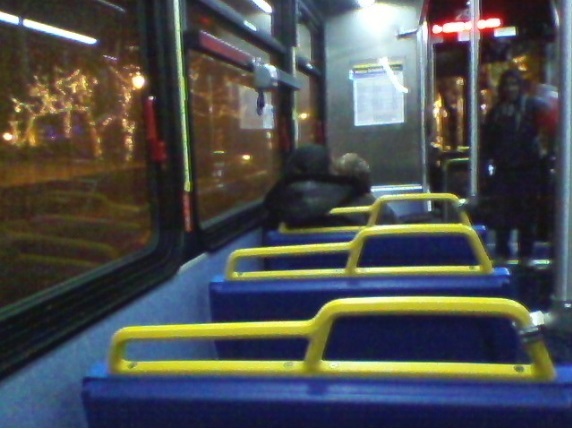 Everybody on the bus was bundled up. The second photo was taken on my way home on board another NABI, this one a Bronx-bound No. 2. We're stopped at the light at Palisade and Roberts Avenue. 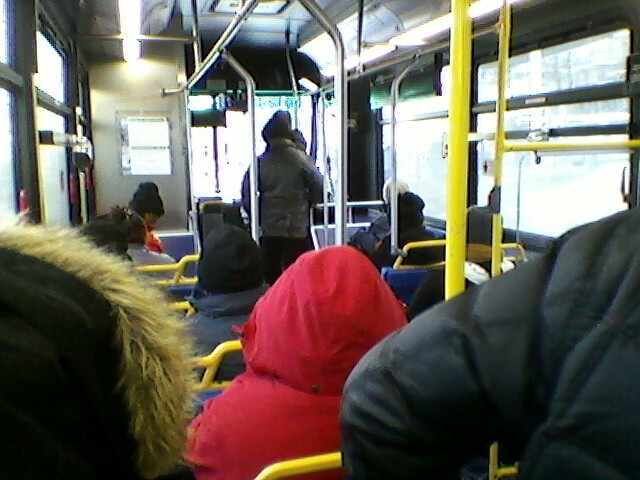 Snowy, wet and cold day but warm and dry on the bus! Do all of the Bee Line 40-foot buses have 2 x 2 seating in the front section of the bus (between the front and rear doors)? I'm not a fan of that arrangement because it really limits standee space and movement, but most transit agencies besides NYC seem to have this on their low-floor buses to maximize seating capacity.